This Polish-American chicken recipe is referred to as Polish wedding chicken because it was often prepared this way for nuptials (ślub), festivals and church suppers. The meat is moist and it falls off the bones. Once it comes out of the oven, it holds well in a steam table pan, making it perfect for buffets or family-style dinners so popular at Polish-American receptions. This recipe makes a variable amount. Plan on 3/4 pound uncooked chicken per number of servings desired and 1 large onion for every 4 servings. Check out these other popular Polish-American wedding foods. Heat oven to 450 F. Season chicken with salt, pepper, and paprika. Rub all over with oil. Place in an uncovered roasting pan and bake 15 minutes, turning once. 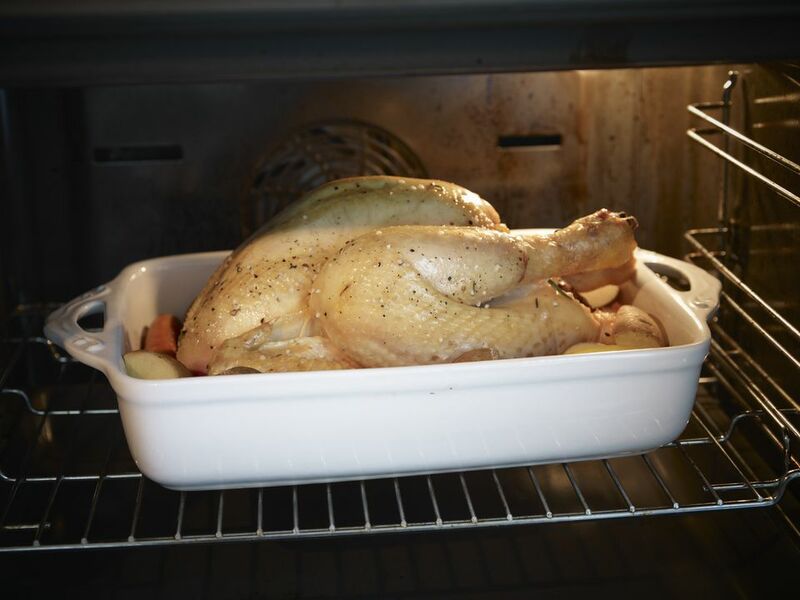 Reduce heat to 350 F. Scatter sliced onions over chicken, cover and bake 60 to 80 minutes, basting frequently with stock and / or pan drippings, until golden brown and an instant-read thermometer inserted into the thickest part of the dark meat registers 165 F. If chicken isn't browning, remove cover. The chicken breasts will be done before the legs and thighs. When the breasts reach 165 F, remove them to a platter and loosely cover with aluminum foil while the dark meat finishes cooking. Serve with pan drippings and the onions from the roasting pan that have caramelized. Greek weddings are notorious for large, splashy affairs that go on forever. Well, Polish weddings are very similar. I have fond memories of the many ślubs (wedding receptions) I attended as a child. In America, the Polish diaspora or Polonia observes different wedding food customs from state to state and from family to family. But, basically, a wedding reception meal is marked by a good hearty soup, braised meats, sausages, sauerkraut, salads, breads, and desserts galore, in particular chruściki, known as angel wings in English. Years ago, weddings frequently were celebrated for three or more days. On the wedding day invited guests gathered at the bride's home where musicians played as they accompanied the wedding party all the way to church. The parental blessing and presentation of bread and salt to the couple before the actual ceremony was as important as church rite itself. If a mother or father had died, the wedding party would stop at the cemetery to ask a blessing of the deceased parent. To this day, many of these customs still exist in Poland. Read more about Polish customs and about Eastern European wedding customs in general.